The 05103 Wind Monitor is a light-weight, sturdy instrument for measuring wind speed and direction in harsh environments. Includes mounting pipe and Nu-Rail fitting. 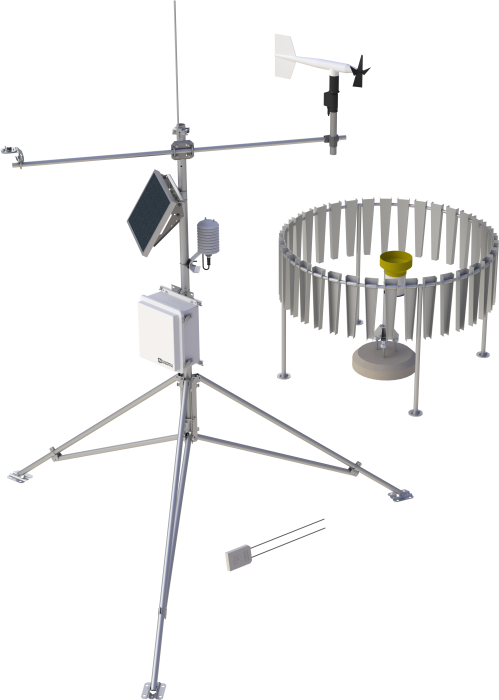 The WindSonic1 is a two-dimensional ultrasonic anemometer for measuring wind speed and direction. Includes mounting pipe kit. The CS320 is a heated, digital thermopile pyranometer that measures broad-spectrum solar short-wave radiation. Includes mounting hardware. The EE181 is a rugged, accurate air temperature and relative humidity (RH) probe that is ideal for long-term, unattended applications in harsh environments. The CS100 is a research-grade pressure sensor, measuring barometric pressure in the range of 600 to 1100 hPa (mBar). The TE525WS-L tipping-bucket rain gage conforms to the National Weather Service recommendation for an 8 in. funnel orifice. The TE525MM tipping-bucket rain gage has a 24.5 cm funnel. The 260-953 is an alter-type screen used to minimize precipitation measurement errors caused by wind. Option when it isn't necessary to minimize the effect of wind on rain or snow measurements. The CS655 is a multi-parameter smart sensor that monitors soil volumetric-water content, bulk electrical conductivity, and temperature. Option when it isn't necessary to measure soil moisture. The CR6 Measurement and Control Datalogger has universal (U) terminals to allow connection to virtually any sensor—analog, digital, or smart. This CR6 Measurement and Control Datalogger also offers built-in Wi-Fi capability, making it ideal for short-range, wireless IP communications. This CR6 Measurement and Control Datalogger also offers a built-in 900 MHz frequency-hopping spread-spectrum 1 W radio for long-range wireless communication. Communications options for this station are integrated with the datalogger and are selected in the Datalogging section. The SP20 is a general-use solar panel that provides extra charging capability for demanding applications that may have higher-than-average power requirements. It is also suitable for positioning in areas with less solar coverage, lower sun angles, or colder climates. The CM106B is an adjustable, general-purpose tripod designed for mounting sensors, solar panels, antennas, and instrument enclosures. The CM300 is a 23-inch mounting pole with 23-inch short legs. The CM300 is a 23-inch mounting pole with j-bolt kit used to attach the pole onto a concrete foundation. LoggerNet is a software package that supports programming, communication, and data retrieval between dataloggers and a PC. It consists of a server application and several client applications integrated into a single product. Choose this option when you already have LoggerNet or use special or custom software built for your application. Please consult with a technical sales engineer. The MetPRO™ is a highly accurate, durable, research-grade meteorological monitoring station, designed for a wide variety of demanding environmental applications. This portable tripod station is suitable for both long-term and temporary deployments on flat or uneven terrain. This system includes high-quality sensors, which are needed for defensible data in environmental research, as well as critical operations dependent on continual weather monitoring. Meteorological variables measured can be used to calculate many weather-related algorithms such as evapotranspiration, growing-degree days, wind chill, dew point, and other weather-related parameters. The MetPRO™ can be ordered with the parts shown above or as a complete prewired, preprogrammed, preconfigured system for an additional cost.